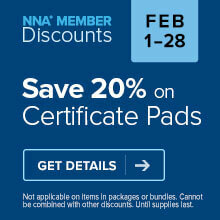 We know you don’t want to miss out on the “Early Bird”special discount registration for the NNA 2013 Conferencein Austin, Texas, but that discount ends in just a few hours — midnight, January 31. The dynamics of notarization are evolving with new signing regulations taking effect, new state rules, and a growing emphasis on training, education and professionalism in all aspects of the industry. This year’s Conference, with a theme of “Knowledge 2.0”, will feature seminars and presentations to help you better prepare for the coming changes. Some of the valuable offerings include “Hot-Button Issues,” “Ways to Avoid Liability Pitfalls,” and specific ideas for promoting your business. Along with the educational aspects of Conference, attendees will get to meet their counterparts from across the country, exchange ideas and suggestions and forge new friendships. If you are planning on attending, but have not yet signed up…”time’s a-wasting” as the saying goes. The Conference site, the Austin Renaissance Hotel, is also offering a discounted room rate for early bookings. Register today and join us, greet friends from previous Conferences, and make some new contacts at NNA 2013 Conference.